I recently spoke on an amazing panel, thanks to the Business Women’s Giving Circle. There were several themes that came out of that event that I wanted to capture because I know it will help individuals understand the many benefits of joining a board. Joining a nonprofit board is an excellent and enormous commitment. Many nonprofits rely heavily on their board for institutional support that would ordinarily be managed by the organization in the for-profit world. This means, in addition to the inevitable need to fundraise for the cause, board service takes time, energy and resources – all of which you are providing on a volunteer basis. It may seem daunting to take on this sort of responsibility, but there are some critical benefits to joining a board that makes the burdens worthwhile. Before you join a Board, you must be very clear on what you want from the opportunity and what you can provide to the organization. If you are not clear on why you want to join an organization, as well as how much time you actually have for the Board – then figure these questions out first. Often, in the course of your career, you are called upon to demonstrate skills and experience in specific areas to be considered for a new position. Whether it be a promotion or a new job entirely, it isn’t always possible to gain the experience expected of you by simply doing your current job. Nonprofit boards are “working boards” meaning that board members fill the needs of an organization that doesn’t have the resources to hire employees for all necessary work. By joining a board and volunteering to take on specific roles, you can gain the experience you need for your professional development. In particular, nonprofit boards provide opportunities for leadership. Serving on a committee or being an officer of the board or taking the lead on a board initiative will give you critical leadership experience that is always a professional benefit. Most corporations will want their senior leaders to serve on a Board to show community engagement. You should always be assessing and evolving your network. Joining a nonprofit board gives you the opportunity for a meaningful connection with other board members and people interested in the same cause. These people will be a diverse group, likely far removed from your professional network. However, in the course of your work on the board, you will be able to connect with them over a shared interest. As a result, the connections you make as a board member add to your network in a way that your professional network never could. You have people that see you in a different light and can help you in different ways. That said – make sure you manage your engagement so that you do not negatively impact your personal brand. It is incredibly rewarding to participate actively in the support of the cause when you are giving of your personal time and energy. When considering joining a board, pick a cause that really matters to you. You will be making a big commitment, and you should bring passion and dedication to the work. You will provide additional benefit to the organization and the cause if you can be present and authentic in your efforts. Nonprofits need valuable contributions that go beyond dollars. Board service is an opportunity to make that contribution. Research non-profits and causes that you care about – there are plenty of tools to leverage like BoardLink, BoardSource, and BoardMatch. If you don’t believe in the cause, I encourage you to find the right cause and get behind it. Nonprofit organizations need to have a public presence, and being a member of the board lets you be a part of this visibility. When the organization issues press releases or hosts events, the board is frequently prominent. This means that your name can be tied to the activities of the organization and the role of board member. In addition, these occasions are opportunities for you to make meaningful, interesting social media communications on your own behalf while promoting the cause that matters to you. Board members are often called upon to be out in the community, representing the organization. This presents another opportunity to increase your visibility. 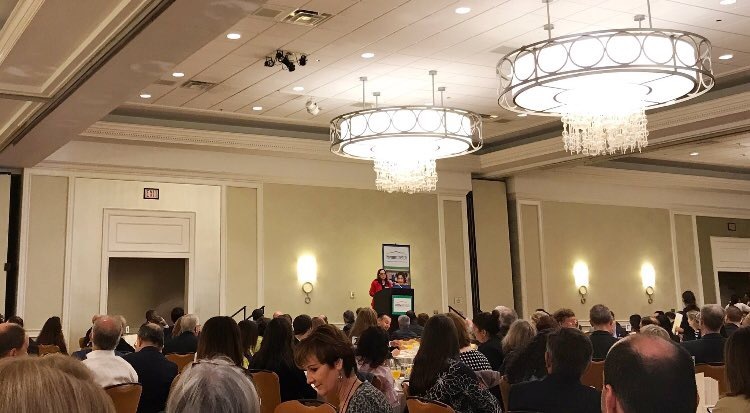 The photo for this blog is a picture of me speaking at the Annual Benefit Breakfast for Homestretch. I was able to speak to a group of 500+ business and community leaders about the impact their support would make. Board service can bring work fulfillment or can show you other career options. Finding an impactful external activity to complement your work commitments can be just the ingredient you need for a good work/life balance. Also, as discussed above, board service can bring opportunities for growth and promotion within your current role. On the other hand, board service can give you the opportunity to learn about different roles and responsibilities. In the course of your work on a board, you can gain a sense of what you like and don’t like about your current professional role, while exploring other roles that may be of interest to you. If you find an interesting challenge while serving on a board, you can leverage your newfound clarity and experience to make a career pivot. Many nonprofits rely heavily on their board to do important work for the organization. If you have a cause that you believe in, joining the board is an excellent opportunity to give to that cause. At the same time, it is an opportunity for personal and professional growth that will add significant value to your career.